What we call as vacuum is actually absence of particles as we know them. But Brahma (our expanded spacetime) is teeming with energy of different force-fields, according to science. These force-fields have energy and it is called ‘vacuum energy’. When vacuum energy crosses a threshold particles and antiparticles manifest. But if we understand the Vedic mapping of these forces, this can be explained. We have to understand how Rudras are depicted in the Vedas, their relationship with Brahma. Hiranyagarbha is spacetime. Brahma is expanded Spacetime (post cosmic inflation period, Hiranyagarbha is called Brahma, the expanded or large one). Brahma is said to have four faces because spacetime is four dimensional. (will talk about a ‘fifth’ face of Brahma, a fifth dimension and how it got bumped off). In this Brahma, the expanded four dimensional spacetime, manifests the Rudras, the force-fields. Rudras are force-fields or vibrations that manifest in this expanded four dimensional spacetime or Brahma. There are eleven rudras or force-fields that manifested in the expanded Spacetime (Brahma) at different points of time. These force-fields are called ‘catuspada’ or four legged beings as they manifest in four dimensional spacetime (not all of them in my view, but more on that later). In these four-legged force-fields, two-legged beings (particles and anti-particles) appear. They are called dvipada. Some of the particles are their own anti-particles. They are the ekapAda. These particles and anti-particles interact with each other, create bigger ‘ganas’ or ‘sets’ of atoms which then create molecules, compounds and biological life. Svetasvatara Upanishad says ‘eko hi rudra na dvitiyaya tasthurya imAn lokAniSata isAnibhih". Rudras are the ONLY 'constancy' in Universe. There is nothing else that is. There are only force-fields in this Universe that is constant (relatively). There is nothing else other than them. Everything in this Universe from Dark Matter to matter and beings that are born are all force-fields (rudra). 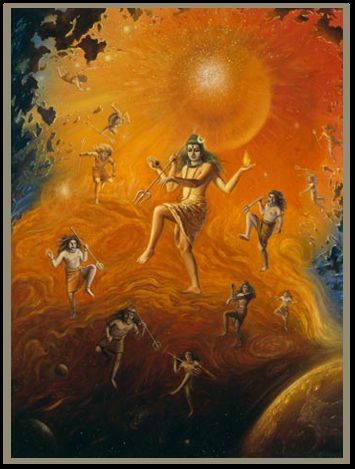 There are eleven Rudras that manifest in this Universe at different points of time. In these eleven rudras, physical properties of Shiva (Energy) and Vishnu (mass) manifest. Since Shiva and Vishnu describe the ‘Sthula’ (gross/physical) properties of force-fields, they are masculine. Shiva (Energy) is characterized by Momentum (Shakti) or motion. Vishnu (mass) is characterized by impediment to motion (Lakshmi). Since Shakti and Lakshmi describe the ‘Sukshma’ or internal property of force-fields they are feminine. The physical property of ‘mass’ or impediment to motion manifests in three force-fields. They are Higgs, Dark Matter and Unified field of Dark Matter and Higgs. Apart from these three force-fields any force-field that interacts with Higgs, has its motion impeded and hence ‘mass’ manifests in those force-fields. For eg. in Dirac-Fermi fields and Weak force fields ‘mass’ manifests due to interaction with Higgs field. The physical property of ‘energy’ similarly appears in eight force-fields. The energy in the force-fields not only interacts with other force-fields but also impacts the very spacetime in which they manifest. They can bump-off a dimension of spacetime or expand it. Thus, rudras though they manifest in the Brahma (expanded spacetime), can control or destroy the Brahma. Indeed a Rudra bumped off the fifth head of Brahma. This is how the elusive the ‘fifth’ dimension got shortened. More on the ‘fifth’ dimension/ fifth head of Brahma, that leads to Quantum Entanglement (in my proposition) in subsequent blogs. Let’s understand these Eleven Rudras or eleven force-fields and how Shiva and Vishnu manifest in these rudras..
Shiva (Energy), the physical property of force-fields, manifests in two forms in all matter. Hence he is said to have two children. One is potential, which is called Ganapati. Another is kinetic, which is called Skanda. Ganapati is the leader of the ‘Ganas’ or sets. The ‘Ganas’ here are the sets of sub-atomic particles that form the atoms, elements, compounds and molecules. The leader of the Ganas or the leader of these ‘sets’ (of atoms, elements, compounds etc) is the ‘potential’ energy present in them. Skanda is the one that hops/effuses/moves out. It is the kinetic form of Shiva or Energy. A top-level quick summary that this model of Rudras (force-fields) and Brahma (expanded spacetime) offers in solving the paradox of large vacuum energy value and small cosmological constant value is this. The vacuum energy density is the ‘potential’ energy present in the eight force-fields or eight Rudras that manifest at different points of time.. It is obviously large. The cosmological constant is the energy density of one particular force-field, which is the quintessence force-field, or which I call nRRti Rudra, the Rudra of Dark Energy, that keeps expanding the Spacetime. Thus from this Vedic mapping view, what causes the expansion of spacetime is nRRti Rudra, the force-field of Dark Energy whose energy density is way way smaller than the vacuum energy density that is measured across several force-fields of the Universe. Current models propose vacuum energy as the ‘reason’ for spacetime expansion. But from the vedic reading I think dark energy is a field that expands the spacetime. There are seven other fields (that manifested at different points of time), the energy of all these fields summed up becomes the vacuum energy as measured in quantum physics. The next question then is why is nRRti Rudra accelerating the spacetime expansion now..? What is the rate at which it is expanding, what is the end point of this expansion..? Understanding nRRti will answer it. More on it also subsequently.. The names of Eleven Rudras have not been common across puranas. Though there overlaps, there are also different names of Rudras in different puranas. In my work on Rudras, I could find in most cases, all these names actually point only to eleven distinct groups of Rudras. In other words, out of hundreds of names of Rudra, we can make eleven distinct/unique groups of Rudra names and can map them to eleven force-fields in the Universe. Let me explain these eleven in the next post.